Located in the centre of the old city, this congregational mosque was built by Sultan Ahmed Shah in 1423. Built in yellow sandstone, it combines the best of Hindu and Muslim styles of architecture, standing on 260 pillars supporting 15 domes at varying elevations It is described as the most beautiful mosque in India. The vast paved courtyard is a rectangle nearly seventy-five metres by sixty-six metres.The whole of the western chamber is a big hall, standing on 260 pillars all carved from Hindu and Jain traditions.The central courtyard is accessible from the East, though there are three ways on the other side too. The Eastern side entrance leads to another enclosure containing the mausoleum of Sultan Ahmed Shah. The tomb houses the graves of three great rulers of Gujarat - Ahmed Shah I, his son, Mohammed Shah and his grandson, Qutub-Ud-Din Ahmed Shah II. After a passage of 100 years, a nobleman by the name - Farhatul Maluk repaired the tomb, who also got the walls of the mosque engraved. Today after centuries of heat and rough weather, the Masjid stands unchallenged serving as a prayer place for numerous Muslims residing in the city. 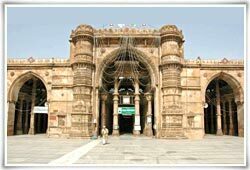 Among the most popular sights of the city of Ahmedabad is the Jama Masjid, boasting of a well-proportioned architecture. It took 13 years to complete this fine example of Indo-Saracenic architecture of the Ahmed Shahi style. A white marble paved courtyard, with a pool in the middle provides a perfect pause between the raucous streets outside, and the dignity of the main sanctuary within. 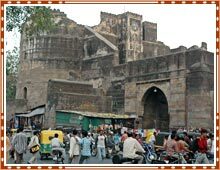 Nearby the Masjid are Pols and the Teen Darwaza (The Three Gates). Sultan Ahmed Shah built these arched gateways, which were meant as the royal entrance to the Maidan Shah or Royal Square. From here the Sultans used to watch the processions from the palace to the Jama Masjid It is located in the centre of the old city. 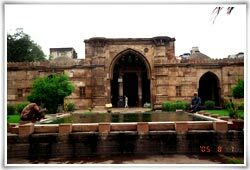 Nearby are the superbly proportioned 1465 AD mosque of Muhafiz Khan, splendidly carved with a 3 arch façade and minarets, the Saiyad Usman mausoleum - said to have started a trend for corner minarets in 1460s and the 16th century mosque of Hasan Muhammad Chisti having some of the finest jali-work traceries in India. The Gandhi Ashram situated alongside the Sabarmati River, was the nerve center for the Indian Freedom movement. The beautiful ashram complex with it's shady trees offers a refuge from the loud streets of the city. There is a museum inside the Ashram complex. 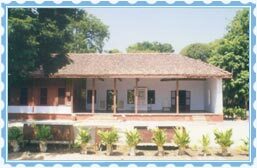 During the lifetime of Mahatma Gandhi it was known as Satyagraha Ashram. After Gandhiji's return from South Africa, he decided to settle in Ahmedabad. It was for four reasons that he selected this place - In his own words "being a Gujarati, I'll serve my country best through the use of Gujarati language.As Ahmedabad was the centre of handloom in early days, the work of spinning wheel (charkha) could be done in a better way, I believed. Mahatma Ganghi fondly known as Bapu lived here from 1917 until 1930. It was a human laboratory where the Mahatma could test his moral and spiritual hypotheses.The Ashram at Sabarmati displays the Mahatma's letters and other possessions and collection of photographs of his years of India's freedom struggle. It is a peaceful, serene stretch on the banks of the Sabarmati river which is a national monument today, and it is here that one gets a glimpse into the simplicity of the great man. It was from here that the Mahatma and his band of followers led various Satyagrahas, the most notable being the historic Dandi March– a journey that ultimately culminated in the ending of the British rule. The light and sound show in the evening is an added attraction for visitors to this place. 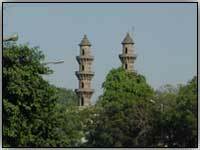 It is located at the river side of the Sabarmati river, Ahmedabad, Gujarat. About 19 kms north of Ahmedabad this stepwell is an architectural wonder built by Queen Rudabai and is certainly one of the finest monuments of Gujarat. It is a seven-storied structure in the form of a well with chambers one behind the other. 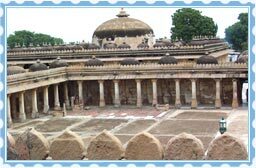 The ‘Vavs’ or stepped wells of Gujarat were used as meeting and resting-places during summer since their cool interiors offered unbelievable respite from the scorching sun outside. 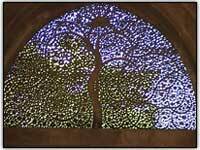 The 'Vav' (step-well) at Adalaj derives its name from the lady patron, Ruda, wife of the Vaghela chief, Virsinh. There is an inscription in Sanskrit, which gives the entire history with exact dates. Stepwell perhaps is a unique feature of Gujarat, which speaks of the history, culture, and architecture. It was also considered to be a religious obligation. 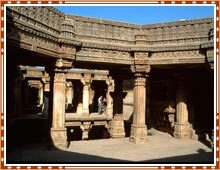 Kings, rulers, umraos and the rich people of Gujarat spent huge money for constructing these. These step wells used to be frequented by travellers and caravans as stopovers along their trade routes. A unique characteristic of step wells was that they not only conserved water but were also cool chambers where one could rest during hot summer months. In times of drought and scarcity these wells were of great use to common man.